The processor wars have gone from a game of who's got the most hertz to one of how many cores can we cram onto a single chip - and if more is truly better, MediaTek appears to be winning for now. MediaTek has announced the MT6592 System on a Chip (SoC), which the Taiwanese company proudly touts as the "world's first true octa-core mobile platform." Aimed at high-end smartphones and tablets, the MT6592 is a successor to the chipmaker's quad-core platform. It features eight CPU cores, each capable of up to 2GHz clock speeds. MediaTek also built a robust multimedia subsystem into the MT6592, which uses a quad-core graphics engine to power advanced video playback capable of Ultra HD 4K H.264 content as well as new video codecs such as H.265 and VP9. The MT6592 isn't just about raw processing power: MediaTek claims the SoC architecture is fully scalable, and can tackle more demanding tasks with all eight cores while keeping power consumption in check for optimum performance and longer battery life. 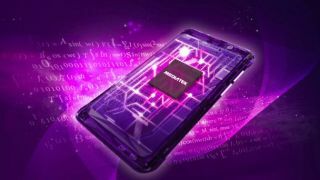 ARM Vice President of Strategy and Marketing, Processor Division Noel Hurley said that MediaTek's MT6592 is "the first to use the power-efficient ARM Cortex-A7 processor in an octa-core configuration with the ARM Mali GPU." Samsung too laid claim to eight-core power with its Eyxnos 5 chips, but it was later revealed that not every core is working at the same time. In October, a report surfaced the Samsung would even tap MediaTek's MT6592 for its own cheap octa-core tablets. The MT6592 SoC incorporates an advanced multi-mode cellular modem, 802.11n Wi-Fi, Miracast screen sharing and the usual array of Bluetooth, GPS and FM tuner options typically found on chips with fewer cores. MediaTek said the MT6592 will make its debut on Android 4.3 Jelly Bean devices by the end of this year, with Android 4.4 KitKat products expected in early 2014, though it's likely those devices will debut in regions like China first. It's almost here: Get a peek at our hands-on review of the Xbox One!